StockMarketEye supports Canadian securities from the Toronto Exchange (TSX) and the Canadian Venture Exchange (CNDX). You can also setup your Portfolios to be denominated in Canadian dollars. In the case of Canadian securities, those that trade on the TSX are suffixed with a “.TO”, while those that trade on the Venture exchange are suffixed with a “.V”. 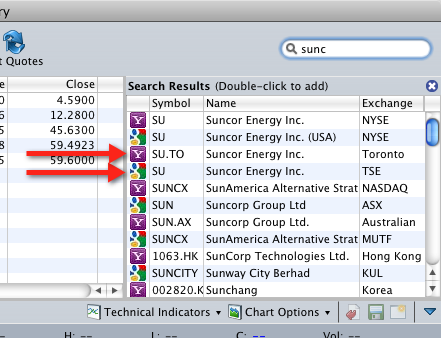 For example, Suncor, whose ticker symbol on the TSX is “SU”, on Yahoo! Finance is “SU.TO”. Canadian Western Bank on the TSX is “CWB” but on Yahoo! Finance is “CWB.TO”. Alange Energy Corporation, which trades on the Venture exchange as “ALE”, is “ALE.V” on Yahoo! Finance. If you are having problems finding your ticker symbols with the built-in symbol search, you can go to the Yahoo! Finance Canada website and use any symbol you find there directly in StockMarketEye. See the section on Data Providers on where to find the ticker symbol on Yahoo! Finance. In the case of Canadian securities, those that trade on the TSX are prefixed with “TSE:”, while those that trade on the Venture exchange are prefixed with “CVE:”. For example, Suncor, whose ticker symbol on the TSX is “SU”, on Google Finance is “TSE:SU”. Canadian Western Bank on the TSX is “CWB” but on Google Finance is “TSE:CWB”. Alange Energy Corporation, which trades on the Venture exchange as “ALE”, is “CVE:ALE” on Google Finance. Quotes for Canadian mutual funds are only available through Google Finance. The prefix, “MUTF_CA:”, is used for Canadian mutual funds. 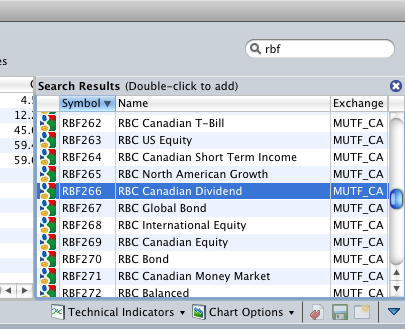 For example, Royal Bank of Canada’s “Canadian Dividend” fund can be added to StockMarketEye using the ticker symbol, “MUTF_CA:RBF266”. 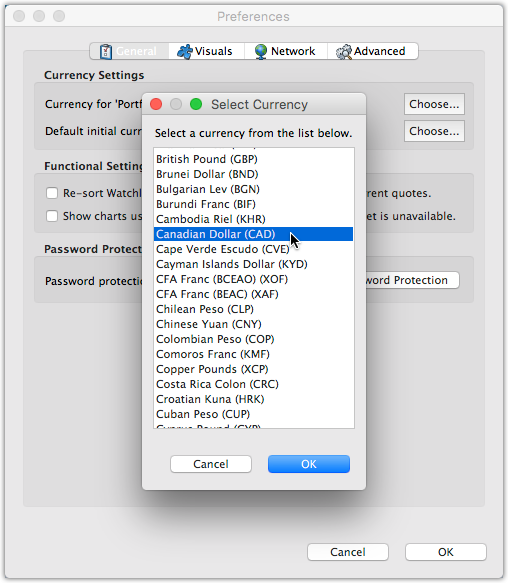 In the Properties window, go to the “Currency” tab. Here you can change the currency from US Dollars to Canadian Dollars. Scroll up and select Canadian Dollar (CAD) in the list. 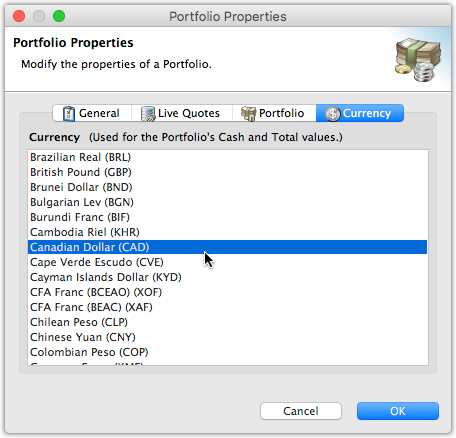 By default, StockMarketEye creates portfolios with US Dollars as the currency. You can change this as well as the currency used in the Portfolios Summary view to use Canadian Dollars. 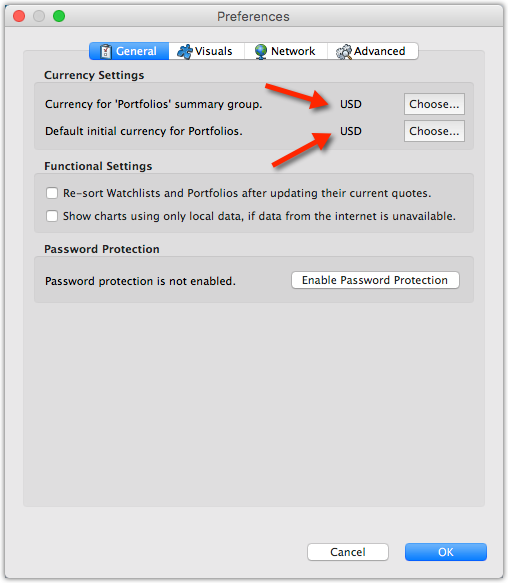 As you did in the Portfolio Settings dialog, scroll up in the list and select Canadian Dollar (CAD), then click OK. Now do the same for the “Default initial currency for Portfolios”. Finally click OK in the Preferences window for the settings to take effect. If you now click on the “Portfolios” item in the list on the left-hand side of the StockMarketEye window, you’ll see the Portfolios summary group’s Totals view. Note that it now uses Canadian Dollars (C$), rather than US Dollars ($). By default, StockMarketEye calculates the cost basis of your positions using the specific lot basis. However, you can change your portfolio to use the average cost basis (ACB) instead. 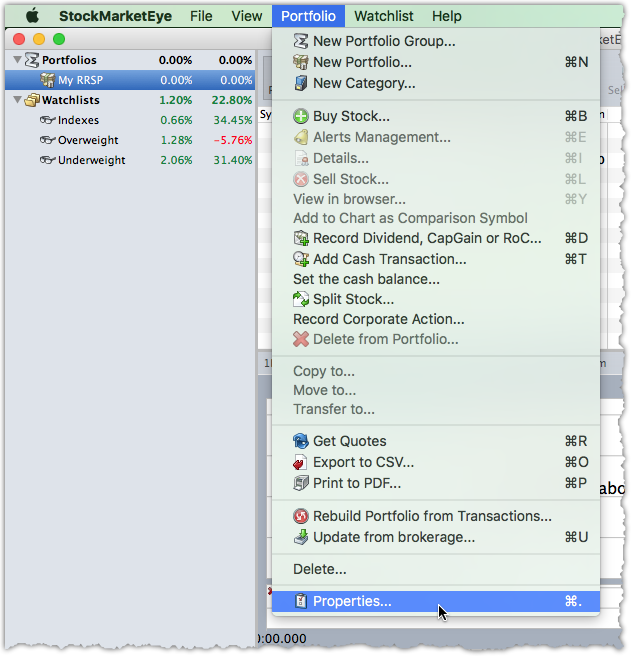 To do this, open the portfolio’s Properties window, select the “Portfolio” tab, then check the option “Use the Average Cost Basis (ACB) calculation for cost basis reporting”.